Most savvy shoppers employ a filtering process for selecting a purchase: they narrow down potential options by factors such as color, size, price and brand. Whether shopping in the grocery store, the car lot or Amazon.com, most people have a pretty good idea of how much they can or are willing to spend for any particular item or service, thus the cost factor is generally significant in the filtering algorithm (you wouldn’t seriously shop for an Aston Martin on a KIA budget). The same is true for parents and students who are in the process of selecting a college or university. Enter the sticker price problem. Many schools, both public and private, are losing potential students before they even have a chance, simply because prospects immediately gravitate toward the advertised price of a school at the very beginning of their college shopping process. If the initial sticker price doesn’t fit within their budget, that school is immediately disqualified. What many parents and students don’t understand is that the sticker price is typically very different from the actual price. 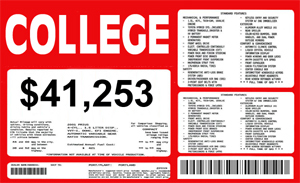 A 2012 survey of 400 private institutions by the National Association of College and University Business Officers found the average grant to first-year students reached 51 percent of the tuition-and-fee “sticker price” in that academic year, up from 49.8 percent in 2010-11. This level of discounting has the potential to positively affect a student’s early attraction to a college – if they only knew about it. Yet most don’t. A recent national study conducted by Longmire and Company found that less than 20% of families said they had a thorough knowledge and understanding of their financial aid options during their college selection process. What’s more, the mandated net price calculators don’t seem to be helping much. Many colleges are reporting that prospective students and parents are simply not using them. And when they do attempt to use them, they are exiting the process before entering enough information to provide a sense of the true cost of attending. Assuming that we are not about to start running ‘Half-Off’ promotions, what are our alternatives? First, start promoting affordability early. Very early, as when students and parents first become aware of you. We know that cost and affordability are part of a larger discussion of value. But many students and parents will never get to the discussion of value if they can’t get past an inaccurate perception of cost and affordability. One of our most successful clients is a seasoned enrollment manager who always promotes cost and affordability first. He has been highly successful doing this in running the enrollment management departments of both private and public institutions. It enables him to begin a serious conversation of cost, affordability and value with prospective students and parents at the same time they are dismissing (perhaps unfairly) the colleges they see as too costly and unaffordable (even though they are not). It’s helpful to start talking about money in every channel of your search. You can promote the fact that students within specific GPA ranges, standardized test scores, and household incomes, are likely to receive specific levels of aid. It’s not a promise, of course, but it provides a factual basis upon which students and parents can begin seeing you as a viable option. Other methods for promoting affordability? Use your blog to discuss financial options, and open the discussion of the affordability of your institution through the social networking channels in which you are already being discussed. Conduct webinars and produce videos about making college financially accessible. Students and parents need to see the affordability message early and often to keep your institution in the running during the early selection process. Don’t wait until a prospect is sitting in your admissions office to discuss affordability. If all they see is the sticker price, you may never get the chance. Longmire and Company is launching a national co-sponsored study called “The Value Proposition” in which we will examine, in unprecedented detail, how students and parents perceive the cost, affordability and value of higher education, in general, and of specific colleges.